There is a tectonic shift happening in the employer-employee relationship. It wasn’t long ago, people looked to their companies for a decent salary, benefits, and a path to move up in the organization. Work and personal life were usually more segmented, with the latter being where people invested their time and energy to gain a sense of purpose. While the pursuit of purpose in the form of “workism” can be dangerous, most employees today appropriately expect a new level of fulfillment from their jobs. Technology and a broadening definition of community have integrated our lives, and in this new reality decisions about where to work and how long to stay are now based on more than compensation and career advancement — whether we like it or not. To have a fighting chance in the war for talent, companies have to provide the opportunity for meaningful work, authentic connections, and making a difference. This move towards more purpose at work is not simply a millennial trend or an idea unique to socially conscious companies, it is a powerful force that is redefining the corporate landscape as we know it and keeping many leaders awake at night. So what does a purpose-driven company look like, and what role do leaders have in this new world? The demands of creating purpose and offering impact at work often make executives nervous. Do we have to be saving the planet? No. 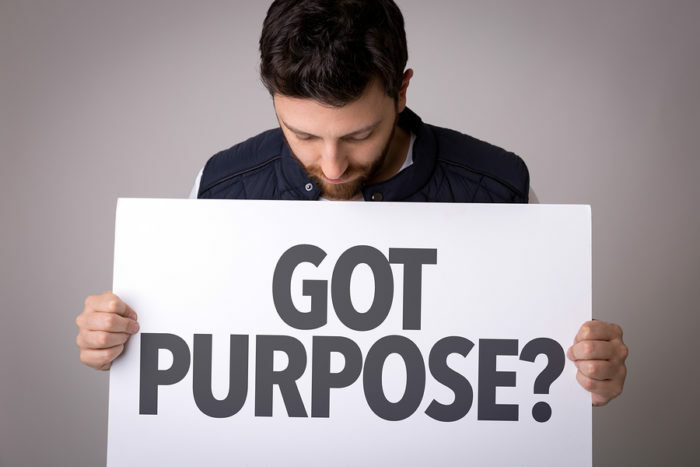 But leaders of purpose-driven companies need to identify the company’s reason for being, in other words – how it positively impacts the employees, the customers, the world. Identifying corporate purpose begins with the question: What do we do that provides a benefit to society? From that reason for being, leaders create a vision for impact around which the company is oriented. Whether you deliver a product or service, sell to businesses or consumers, whether you are the CEO, CHRO or a first-time manager, it’s essential for you to understand your company’s impact. Because as a leader, you will need to communicate it through storytelling and values, integrate it into your strategy and operations, and prioritize it throughout your culture and resource allocation. Most critically, leaders will motivate and inspire their employees by providing a line of sight to how each person’s work contributes to that impact. A purpose-driven company is also characterized by a people-first culture, and leaders are the primary cultivators of that environment. You’ve heard the saying, “Culture eats strategy for breakfast,” but these days both are needed in healthy portions at the leadership table. Ensuring a collaborative, empowering, and inclusive culture is actually a profound strategy decision. A people-first culture is about recognizing that employees are our most valuable resource, and their personal and professional growth should be one of a leader’s highest priority. Investing generously in the potential of your people will drive critical business outcomes from retention to brand equity. But maintaining those competitive advantages will require a diverse and thriving environment. Leaders at purpose-driven companies cultivate a culture where people can bring their full selves to the job, where authentic connection and meaningful relationships result in a sense of belonging that is core to fulfillment at work. Pulitzer Prize-winning journalist and the author of “The Power of Habit,” Charles Duhigg recently wrote in the The New York Times, “…a job is usually more than just a means to a paycheck. It’s a source of purpose and meaning, a place in the world.” People want to work at purpose-driven companies, where leaders create a shared vision for impact and cultivate a people-first culture. This kind of leader though is not produced through a traditional training program with classroom lectures or online technical modules. As Harvard Business Review notes, much of today’s leadership development is broken. Developing purpose-driven leaders requires a new playbook, one rooted in experiential learning, collaboration with colleagues and the community, and a curriculum focused on critical mindsets and behaviors. Leadership is the greatest determining factor in providing employees more purpose at work, and while it requires significant effort and investment, the return is evident as purpose-driven companies are outperforming their counterparts by a factor of twelve. As human beings, we spend more time working than most other activities in our lifetime. We are often with our colleagues more than our own families. So, it’s no wonder that people are now demanding that their work experience be something that contributes to a sense of purpose and greater fulfillment. Purpose at work is here to stay, and companies need leaders willing and capable to steward this amazing opportunity. It’s time to join the movement. Ten years ago Rich cofounded Spark Ventures, an innovative nonprofit that has raised and deployed over $7M in sustainable development partnerships in Africa and Latin America. As CEO, he designed and championed a world-class impact travel program that has become the core product for Ignite, where he is a founder and co-CEO. His prior background in marketing and strategy included account management for clients including Motorola, Mayer Brown and A.T. Kearney. He worked for 7 years as a university administrator, providing programs for millennial students focused on international service learning.